The Gyrosphere spherical robot is a unique prototype developed by Greg Schroll, a graduate student at Colorado State. The Gyrosphere uses gyroscopes instead of a movable pendular mass; this gives the Gyrosphere extra power. For climbing out of holes, for instance. Greg has been named one of Popular Science’s 10 Most Brilliant Innovators of 2009; he also developed air cannon, as seen in this somewhat longer commercial video. 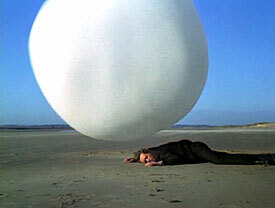 Science fiction fans enjoy the occasional spherical robot, like the Rovers from the 1960's series The Prisoner; I think Rovers will make a comeback in a big way in the Prisoner remake this fall.